Wednesday night: Cold. High, thin clouds. Teens and low 20s. Thursday: Clouding over. Snow/mix starts up by late afternoon. Difficult travel later in the night. Low to mid 30s. Thursday night: Heavy snow turns to mix and rain. Temps steady in the 30s. Friday: Mix/rain turn back to snow briefly. All of it winds down in the early afternoon. Mid/upper 30s. By Friday morning's commute, it will be mostly rain from Boston to Worcester, with a wintry mix in parts of Massachusetts and N.H.
Winter storm watches have been issued for parts of New England from Thursday evening through Friday morning ahead of the first projected snowstorm of the season. Heavy snow is possible, with the potential for difficult travel conditions during the Friday morning commute. Thursday is expected to start cold and sunny, with clouds increasing during the day. A gathering storm will spread rain and snow into New England after dark, first in Connecticut, Rhode Island, and southeastern Massachusetts toward the end of the evening commute. The snow will continue to work northward at night, falling heavily at times inland. At the coast, expect a fairly quick transition to a wintry mix and then rain as winds blow in off the water. By Friday morning, most spots in Southern New England will be over to plain rain, with any sleet or freezing rain limited to areas well North and West of Boston. We’ll dry out by the day’s end. Northern New England, by contrast, will keep seeing snow right into the afternoon. Snowfall will range from a dusting of one inch for most of the immediate coast, with 1-to-3-inches through much of Connecticut, Rhode Island, MetroWest, and New Hampshire's Seacoast. 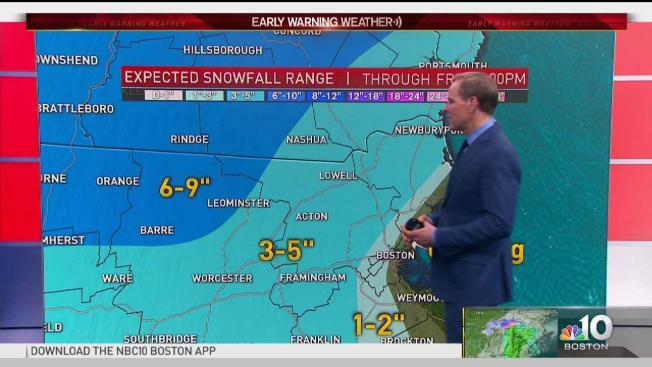 More like 3-to-6-inches is likely from the hills of Connecticut and northwest Rhode Island into central Massachusetts and much of northern New England. Top totals of 6-to-9-inches will be found in the highest terrain of western Massachusetts and the Greens, Whites, and mountains of Maine. 6-9 p.m.: Snow arrives, quickly changes to rain for Cape and Islands. 9 p.m. to midnight: Heavy burst of snow north and west of Boston, changing to rain for the rest of the coast. Midnight to 3 a.m.: Snow changes to a wintry mix and rain in the Merrimack Valley and MetroWest. Still snowing around Worcester points north and west. 3-6 a.m.: Mostly rain Boston to Worcester, wintry mix continues Route 2 into southern New Hampshire. 6-9 a.m.: Last of wintry mix far north and west, rain elsewhere. 9 a.m.-noon: Mostly rain, windy. Noon into afternoon: Rain departs, snow continues in the mountains of northern New England. The weekend will bring us back to sun and briefly milder temperatures. We’ll top out in the 40s. Next week looks quiet overall, but some rain and snow showers will be likely Monday and again Wednesday. Right now, it doesn’t look like either of those systems will result in major travel issues across New England.